The area’s aesthetic will significantly change with the construction of a 106-ft. arched and lit undercrossing beneath Russell Street near Dakota Street. After a comprehensive process of planning, design and public involvement, the Russell Street Bridge in Missoula, Mont., is being fully reconstructed in April 2018. The Montana Department of Transportation, in partnership with the city of Missoula, is rolling out a completely new bridge over the Clark Fork River and improving the roadway and connectivity from Broadway Street to Dakota Street. The new bridge will be 2.5 times larger than the existing structure and will feature numerous upgrades that benefit drivers, cyclists, and pedestrians. The Russell Street Broadway to Dakota project will have a significant impact in the Missoula community. This project is creating new connections in the heart of Missoula. This two-year, $29 million project will provide two southbound and two northbound lanes with raised medians and improved signal devices at Broadway Street to create a safer, more efficient intersection. The current bridge was built in 1957 and the design has since not kept pace with Missoula's growing population and high usage. To address these concerns, the project will deliver significant upgrades including additional vehicle and bike lanes with landscaping, expanded sidewalks, lighting and utility upgrades, enhanced traffic control, trail connections and trail undercrossings. To provide a safer roadway and better access for all types of travelers, the project has been designed with careful consideration given to the area's high traffic volumes, crash history and increasing bicycle and pedestrian usage. The area's aesthetic also will significantly change with the construction of a 106-ft. arched and lit undercrossing beneath Russell Street near Dakota Street to provide safer access for Milwaukee Trail users and to allow for more continuous vehicle flow on Russell Street. 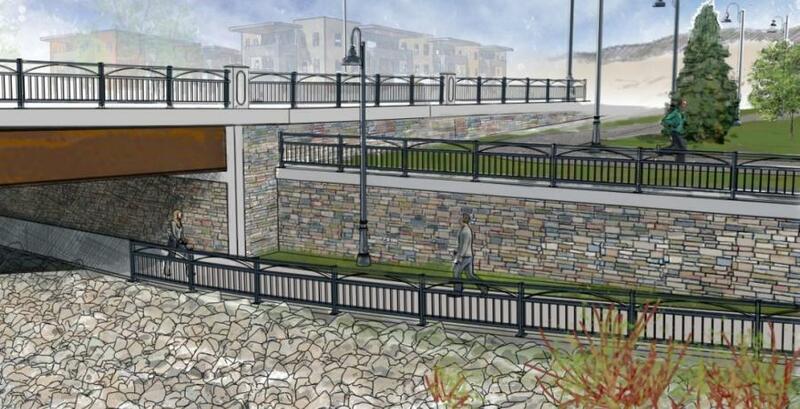 An additional undercrossing will be constructed on the south side of the Clark Fork River providing pedestrian and cyclist access down to the riverfront and to River Road under the Russell Street Bridge. This access point will offer easier connections to the south Riverfront Trail system, McCormick Park and the California Street Pedestrian Bridge. On the north side of the Clark Fork River, the Montana Department of Transportation will build a paved crossing under the Russell Street Bridge to provide access on the east side of the bridge leading up to Russell Street. There also will be a new staircase on the northwest side of the bridge leading down to the Clark Fork River.